Born/lived: Born in Baltimore, MD, lived in NYC and Philadelphia. Known: as landscape painter, scenery painter, book illustrator, active in Baltimore, Richmond, Philadelphia and NYC. Studied: Philadelphia with James Hamilton. Exhibited: National Academy of Design; Art Institute of Chicago; Pennsylvania Academy of the Fine Arts; Brooklyn Art Association; Boston Art Club. Work: Mystic Seaport Museum, Peabody Museum, Salem, MA. Illustrator: Harper’s Leslie’s; “Beyond the Mississippi”. 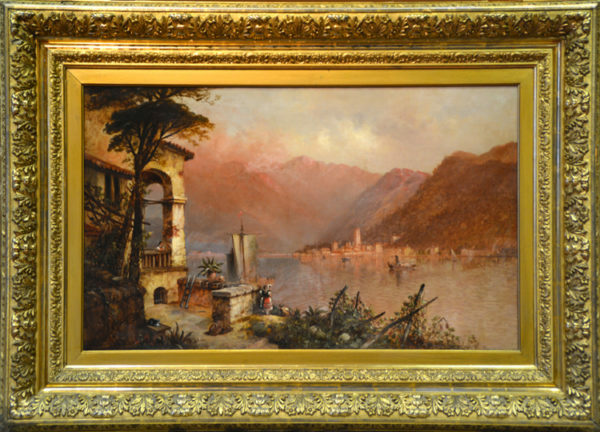 Comments This painting is in excellent condition in a fine carved gold frame also in excellent condition.